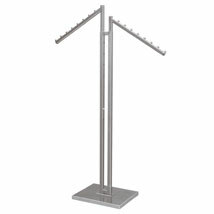 The 2-way clothing rack is a perfect display for featured merchandise or sales items! 2 Way Clothing Rack has 2 waterfall arm that are 18 in. long. This retail clothing rack has arms that are height adjustable at the touch of a button and can extend from 51 in. to 72 in. at 3 in increments. All arms feature a swedge fitting for an optional sign holder. Available in black or chrome. For more items, we ask you to spend some time to look at our whole variety of retail clothing racks for sale at Specialty Store Services now.